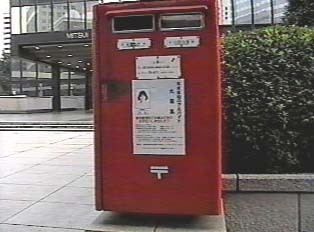 In Japan, the function of the post office is to handle letters and packages, and to sell stamps. Conveniently located, the post office has operating hours of about 9:00 a.m. to 5:00 p.m.. Mail boxes on the street are generally red and can be found everywhere. "Savings Accounts at the Post Office"
"I want to mail a letter to the United States." "I want to mail a package by airmail."